April 7….Glow in the Dark Easter Egg Hunt - Safety City’s 2nd Annual Glow in the Dark Easter Egg Hunt will include glow in the dark games and activities. At the end the night, a glow in the dark Easter egg hunt will be held with prizes for a few lucky winners! The Glow in the Dark Easter Egg Hunt is for tweens and teens ages 9 to 17, and admission is free. For more information call (806) 767-2712. Located inside Clapp Park on 46th Street and Avenue U, Safety City is a unique, miniature town where students learn hands-on the rules of pedestrian, bicycle and traffic safety throughout the school year. Lubbock Safety City Department, 4500 Avenue U; 6 – 8 p.m.
April 7….First Friday Art Trail - See the regular art venues...plus the exciting monthly additions showcasing art and artists downtown and throughout Lubbock. Catch a trolley or bus at many of the locations or pick up a FFAT map at any of the venues to see the art that can be found throughout the community each month during the event. First Friday Art Trail trolleys run continuously in downtown Lubbock during FFAT hours. Trolleys are free and you will find a "trolleyteer" on each trolley who is a treasure trove of info about FFAT and the arts in Lubbock and will help you navigate with ease. The trail runs throughout downtown and Depot District; 6-9 p.m.
April 7….Lubbock Christian University and Wayland Baptist University Combined Choir Concert - LCU and Wayland choirs will combine to perform Morten Lauridsen’s “Lux Aeterna” for mixed chorus and orchestra, as well as Ola Gjeilo’s “Dark Night of the Soul” and “Luminous Night of the Soul” for mixed chorus, string quartet, and piano. This performance represents the fifth combined performance by the LCU and WBU Choirs. Cost is $10 admission, $5 student tickets. 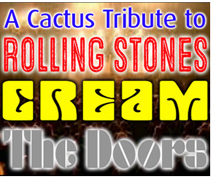 Lubbock Christian University, McDonald-Moody Auditorium, 5601 - 19th St; 7:30 p.m.
April 7….Tribute to The Rolling Stones - Cream - The Doors....In this stellar tribute concert, you'll hear the unforgettable songs by The Doors - including "Light My Fire", "Riders On the Storm", "Break On Through (To the Other Side)", "Love Her Madly" and other big hits. We'll revisit the brief but notable late '60s work by Cream - led by Eric Clapton - a group that produced the classic rock staples "White Room", "Badge", "Strange Brew" and, of course, "Sunshine of Your Love". And, we'll salute the group that many have called The Greatest Rock 'n' Roll Band of all time - The Rolling Stones. Just a small sampling of the songs you'll hear include: "Start Me Up", "Satisfaction", "Wild Horses", "Beast of Burden" and "It's All Over Now". Featured vocalists on this show are Craig Elliott, Jason Fellers, Mark Paden and Amber Pennington...all backed by The Rhythm Machine. Get your tickets now for this highly-anticipated tribute to three of the greatest rock ensembles ever! Tickets only $20 for reserved floor seats; $15 for standard balcony. Purchase tickets by visiting cactustheater.com or call 762-3233. Cactus Theater, 1812 Buddy Holly. Doors at 7 p.m.; show at 7:30. 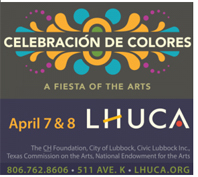 April 7 - 8….Celebracion De Colores: A Fiesta of the Arts - LHUCA will present its first ever Celebración de Colores: A Fiesta of the Arts. The festival begins with the First Friday Art Trail on April 7 from 6 - 9 pm. Programming on Saturday, April 8 begins at 11:30am and ends at 5:00pm. This event is free to the public and will showcase the richness of Latino heritage in Texas through art, crafts, music and dance. All are invited to join us for this festive celebration! Highlights include LatinX: Artistas de Tejas, featuring 13 Latino and Latina artists is dedicated to the recognition and celebration of artists living and working in Texas who are of Mexican ancestry. The exhibition reflects the richness, depth, and diversity of media, themes, and subject matter of these artists who have deep ties to Texas. Many of the artists are Tejanas and Tejanos, Americans of Mexican descent born and bred in Texas. Artists include: Rene Alvarado (San Angelo); Fernando Andrade (San Antonio); Richard Armendariz (San Antonio); Margarita Cabrera (El Paso); Gaspar Eníquez (El Paso); Jose Esquivel (San Antonio); Justin Garcia (Houston); Juan Granados (Lubbock); César Augusto Martínez (San Antonio); Delilah Montoya (Houston); Dario Robleto (Houston); Anabel Toribio-Martinez (San Antonio); and Kathy Vargas (San Antonio). Josué Galvan (Lubbock) will exhibit “A Brown Crayon Experiment: Perdido y Encontrado” (Lost & Found) in the Lott Gallery.Mariachi Los Matadores de Texas Tech will perform Friday, April 7 from 6:00 – 7:30 p.m.Revel in the sights and sounds of traditional Mexican mariachi music as the musicians in Mariachi Los Matadores perform in concert under the direction of Dr. Lauryn Salazar, harpist and Assistant Professor of Musicology. The TTU students in the group represent a wide variety of majors, with representation also from Lubbock High School and South Plains College. The Tejas Brothers will perform on the Reagor Dykes Stage on the LHUCA Plaza: Friday, April 7 from 7:30 p.m. – 9:00 p.m. .“A typical Tejas Brothers medley might start out as a jumpin' Tejano polka, hop into a steam-engine country train song, and then drop you off in a twisting blues rocker. Superhero Fiesta for Kids and Grownups on Saturday, April 8, 12 noon – 5 pm on the LHUCA Plaza, the Christine DeVitt Icehouse and LHUCA Warehouse. Costume contest, kid cape and children’s book giveaways, make-and-take art projects, storytelling, graffiti art demonstrations, spin art, magic shows, bouncy house, games, photo ops, snacks and more! Participants are encouraged to come in costume. Dance performances and classes, Saturday, April 8, on the LHUCA Plaza with our resident Ballet Folklorico troupes: El Ballet Folklorico Nuestro Herencia and Ballet Folklorico Fiesta del Sol. Junior Vasquez will perform on the Reagor Dykes Stage, Saturday afternoon, April 8. The Battlin’ Nelsons will perform on the Reagor Dykes Stage, Saturday afternoon, April 8. This folk-rock band from Austin began three years ago. Originally from Lubbock, the group’s co-founders moved to Austin and started writing songs and performing together. For more information, please contact Mica McGuire at mica.mcguire@lhuca.org or call 806-762-8606. LHUCA, 511 Avenue K.
April 7 - 8….Click....Everyone is invited to this original rock ballet by Scott and Amy Faris. The driving, visceral, yet contemplative music combined with stellar lighting sets the stage for some of Ballet Lubbock’s most interesting choreography yet. Visuals by Dirk Fowler, Choreography by Yvonne Racz Key, Bashaun Williams, Sydney Petitt, Edward Truitt, & Marcos Vasquez. To reserve tickets visit balletlubbock.org/. 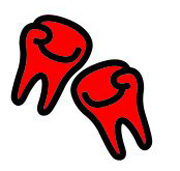 Lubbock Memorial Civic Center Theatre, 1501 Mac Davis Ln; 7 p.m.
April 7 - 9….Lubbock Community Theatre presents: “God of Carnage"- A playground altercation between eleven-year-old boys brings together two sets of Brooklyn parents for a meeting to resolve the matter. At first, diplomatic niceties are observed, but as the meeting progresses, and the rum flows, tensions emerge and the gloves come off, leaving the couples with more than just their liberal principles in tatters. 2009 Olivier and Tony Award for Best Play. Written by Yasmina Reza. Directed by Leah Tyson Houchin. Rated: PG-13. To reserve tickets pkease visit https://lubbockcommunitytheatre.org/tickets/. Lubbock Community Theatre, 4232 Boston Ave; Friday and Saturday: 7:30 p.m. and Sunday: 2 p.m.
April 8….West Texas Salute to Veterans - The City of Lubbock Veterans Advisory Committee, Lubbock National Bank and the Silent Wings Museum will be hosting the 3rd Annual West Texas Salute to Veterans. 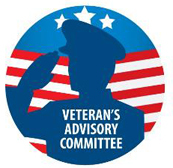 The purpose of this event is to show appreciation to our military service members, veterans, and their families and thank them for what they have done to protect our many freedoms and way of life. This event is free and will include a Veteran’s Resource Fair, and lunch provided by Lubbock National Bank. Participants can visit the Silent Wings Museum on April 8 for free. Activities for children include Bodywork’s spider climber, face painting, Dress like a WWII Solder, Bunker Blast and more. 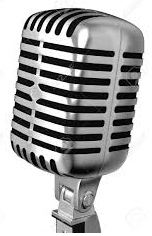 There will be musical entertainment by Junior Vasquez and Hub City Jazz Orchestra. For individuals with disabilities, there will be golf carts to shuttle participants to and from their vehicles. For information on the event, sponsorships or how to host a booth for the Resource Fair, please call (806) 775-2685. Silent Wings Museum, located at 6206 North I-27; 7 a.m. to 2 p.m.
April 8….Walk With Compassion - Walk with Compassion is the walk to end child poverty. 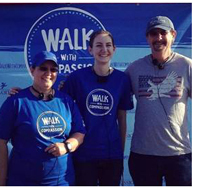 Compassion International’s community fundraising walk series, Walk with Compassion, is designed address the challenges of vulnerable children around the world that go beyond what monthly sponsorship covers. The money we raise together helps to fund critical needs such as: medical emergencies, disaster relief, HIV/AIDS response, caring for unsponsored children, clean water and much more. For more information contact Kim Rodriguez at 800-336-7535 . Mackenzie Park, 301 Interstate 27; 9:30 a.m.
April 8….11th Annual Easter Egg Hunt - Join Hodges Community Center as they host their 11th Annual Easter Egg Hunt on Saturday, April 8, 2017. Festivities begin at 10:00 a.m., with the Easter egg hunt kicking off promptly at 11:00 a.m. Before the hunt begins, families will enjoy pictures with the Easter Bunny, games, and more. Just before 11:00 a.m., the event moves next door to the Lubbock Memorial Arboretum where thousands of eggs will be scattered throughout the Arboretum grounds. Be sure to bring your Easter baskets to collect the eggs during the hunt. Kids of all ages are invited to this free community event. Hodges Community Center is located at 41st Street and University Avenue. The Lubbock Memorial Arboretum is located south of Hodges Community Center at 41st Street & University Ave; 10 a.m.
April 8….Annie's Chat & Chew - For over 20 years, Annie’s Chat and Chew has raised money for Lubbock Meals on Wheels. This fundraiser was started by long-time volunteer Annie Sanders, and is continued in her memory. For a small donation guests will enjoy some of the best fried catfish and other homemade dishes in town. Come on out, visit with old friends, make new ones, and remember a very special woman. All donations benefit Lubbock Meals on Wheels, helping people remain at home, well fed, and independent as long as possible. Call 767-2708 for more information. Mae Simmons Senior Center, 2004 Oak Ave; 11 a.m. - 1 p.m.
April 8….LatinX: Artistas de Tejas, Gallery Talk with Dr. Ann Leimer - LatinX: Artistas de Tejas is an exhibition dedicated to the recognition and celebration of artists living and working in Texas who are of Mexican ancestry. The exhibition reflects the richness, depth, and diversity of media, themes, and subject matter of these thirteen artists who have deep ties to Texas. Ann Marie Leimer received her Ph.D. from the University of Texas at Austin in 2005, where she trained in Latin American Art and Art of the Américas, and specialized in Contemporary Chicana and Chicano Art. Saturday Lectures at LHUCA is an informal conversation over the life and work of contemporary artists. It’s a stress-free opportunity to examine the art and ideas that underlie much of the modern art world. Attendees are encouraged to ask questions and join the conversation. This event is free to the public. Join us for coffee and donuts! LHUCA, 511 Avenue K; 11:30 a.m. 1 p.m.
April 8....The Roundtable presents: Tim Tivis, CEO Pinnacle Training Group "Wake Up and Dream...Living Your Personal Success Story!" Regardless of where we are in our lives or what we do, it is NEVER too late to dream.- Our luncheons are held at Hillcrest Country Club 4011 N Boston Ave, Lubbock. North on University past State Living Facility to Newcomb, left for about 4 blocks and you will come to the entrance of the Hillcrest Country Club at Boston and Newcomb. Meeting Format: People arrive about 11 a.m. to start registering, pay for lunch and some socializing. Food service starts at 11:15 followed by introductions and announcements at 11:30.The speaker will start about11:50 and be finished with the program and questions from the audience by 1 p.m. The public is invited. Lunch/attendance is fifteen dollars ($15) per person. Limited menu includes beverage and dessert. There are no membership fees or dues associated with attending the functions. Any extra monies that you would like to contribute will go towards the speakers lunch and towards our Honors College Scholarship fund at Tech. Our Saturday luncheons are a great way to (1) learn more about current global/US/Texas/Lubbock issues and events, (2) meet other people in area who may become lifetime friends (3) feel more at home in Lubbock. Most wear business or business-casual attire. No RSVP is necessary. Show up whenever your schedule allows, feel free to bring a guest(s) and email this invitation to anyone you think might be interested. For more information email Marie Evans at this address: mevans1398@aol.com. April 8….Arboretum Second Saturday – The featured guest is Greenscape Design Studio, a program of the Texas Tech University, Departments of Landscape Architecture and Plant and Soil Science. Their mission is to provide a comprehensive, personalized landscape design service for Lubbock area homeowners and not-for-profits. Student interns work with faculty professional to provide plans that addresses the owners specific needs, uses plants and techniques that conserve water, and supports the responsible use of our natural resources. Clients pay a reasonable fee for services and the student interns, who are paid, gain valuable experience. Admission is free. Lubbock Memorial Arboretum, 4111 University Avenue; 1 p.m.
April 8….Penny & Sparrow: Live at the Cactus - From the heart of Texas, Penny & Sparrow are Andy Baxter and Kyle Jahnke. The former roommates now tour the world inspired by alt country, a love of musicals, and a vast array of books that include "The Fault In Our Stars" and "A Heartbreaking Work Of Staggering Genius." 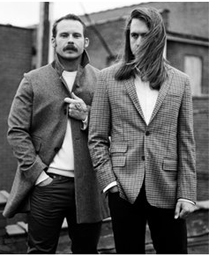 Their most recent record, "Struggle Pretty," released independently and landed #2 on iTunes Singer/Songwriter chart and Top 50 Billboard at #49. Penny & Sparrow have been playing their soulpiercing songs and sharing stories from their heart at venues across the country...steadily building their devoted and steadfast audience. Back by popular request, the Cactus Theater is proud to welcome back these incredible musical troubadours once more! Get your tickets now for what promises to be a stellar Saturday night performance! Reserved seats for this show are only $16 for all standard seats in advance; $20 day of show. Purchase tickets by visiting cactustheater.com or call 762-3233. Cactus Theater, 1812 Buddy Holly. Doors at 7 p.m.; show at 7:30. April 8….April Night Hike - Experience the Yellowhouse Draw at our "Landmark After Dark" night hike. Be sure to wear comfortable, sturdy, closed-toed shoes. Night hikes are always held, weather permitting. For all ages. For more information call 806 742 1116. Lubbock Lake Landmark 2401 Landmark Drive; 7:45 p.m.
April 9….Friends of The Lubbock Public Library Annual Speaker Event - Tim A McKenzie is the guest author speaker. Tim has recorded numerous CDs in the western and cowboy vein with many original works and is a published children’s author of the “Baxter Barret Brown” book series, the third and newest released summer of 2016. He also has performed at the annual National Cowboy Symposium for as years and on stage at the Cactus Theater. Come join the fun and mark your calendar! This event is free for public. Snacks will be provided. Books are available to purchase at the event. There will be book signing at the end of the event. Email events@lubbockfol.org for inquiries with subject line Tim McKenzie. Mahon Library Community room, 1306 9th street; There will be an annual meeting at 2:30 p.m. and the speaking engagement starts at 3 p.m.
April 10….Lubbock Women’s Club Distinguished Speaker Series Presents: Bob Phillips - The Lubbock Women’s Club Historical Foundation and The Ernestine Payne Welborn Endowment Community Speaker Series will welcome Bob Phillips as a speaker for the Annual Speaker Series. For more than 40 years, the back roads of Texas have been home and office for "Texas Country Reporter" Bob Phillips. He was born in Dallas, but spent much of his youth growing up on the family farm near Lake Texoma. It was there that Bob lived with and learned from the folks he calls the "salt of the earth." His "Texas Country Reporter" television series is a celebration of the Texas way of life and a tribute to the "real" heroes of our time -- the everyday men and women who make our state such a special place. Bob started his television career at KDFW-TV (Channel 4) in Dallas, Texas, while he was a student at SMU. He was a photographer and a reporter covering news, politics, where he covered several state and national political conventions and the inauguration of President Nixon, and even sports, where he spent several years traveling with the Dallas Cowboys and shooting for NFL Films. His "Country Reporter" series began at KDFW-TV in 1972 and continued on that station until Phillips moved his program to WFAA-TV in October of 1986 and syndicated the show statewide. Bob's back roads travels have lasted 40+ years and "Texas Country Reporter" is now seen in all television markets in Texas. Kandy Adams, President of the Lubbock Women’s Club said, “We are thrilled to welcome Bob Phillips to Lubbock. If you love Texas and the culture of food, family and travel, then join us for a fun evening at the Lubbock Women’s Club.” The Lubbock Women’s Club, 2020 Broadway: 6:30 p.m. The Question: What does the word "dinosaur" mean?